As a homeowner, you will do renovations, repairs, and restoration on your home. For whatever the reason may be, you may end up selling your home, you might be moving across town, to another state, a bigger home for your growing family. When you are getting your home ready to sell, one of the first things potential buyers will look at is the floor. If your home has tile flooring, Desert Tile and Grout Care have a few suggestions on how to restore your tile floor and why it will add value to your home. Restoring Tile and Grout Flooring Back to New. Selling your house and buying a new home in Phoenix can be quite a hassle. You are traveling here and there, doing a lot of expenses and above that, you have to make sure that your home is adequate and ready to sell. Doing last minute repairs around the house you’re selling seems like an unnecessary chore. However, minor things, like restoring the tile flooring is simple. Desert Tile and Grout Care is have a few tips on where to start and how to get it done quickly. Clean and disinfect your tile and grout surfaces. Having dirty, stained,and moldy tile and grout makes your home look run-down and neglected. A way to clean and disinfect the tile and grout is by using a mild detergent or baking soda and water. If the stains and mold are extreme and difficult to remove, contact a Desert Tile and Grout Care for a consult. Repair loose and hollow tiles. If you have any loose and hollow tiles, it’s create a high possibility for the tiles to chip and break. The future homeowners don’t want to have an expensive renovation on their hands so soon. To check for hollowness, tap the center and all four corners of each tile and listen for a hollow sound. It’s time-consuming and a bit tedious. However, it needs to be done. Replace chipped or cracked tiles. If you already have chipped and/or cracked tiles, replace them. It does not necessary mean a costly overhaul of the entire tile surface, just the individual tiles that are damaged. Replacing a few here and there will be very beneficial. Consider upgrading with the addition of a tiled surface. If you have other material flooring, take under consideration the tile flooring is more attractive, resilient an durable. It might be extensive, but it will be worth it. Plus, it will add value to your home. At least consider adding a tile surface in the kitchen, bathroom and other high-traffic areas. Contact Desert Tile and Grout Care for a quote. We can help with the decision, and guide you through the process. Preparing your home for sale is not fun. It’s a headache. However, take a day or two to inspect the condition of your tile and grout flooring. Restoring the tile and grout in Mesa back to new is relatively inexpensive. The benefit of repairing the flooring will help you sell your home faster and for the best possible price. Plus, the new homeowner will be very pleased that the tile seems new, just like you would if you were looking for a new home. When you’re invited to a house, the first place your eyes lay on is the flooring. Who knows why? Perhaps that’s the reason why homeowners feel the need of sweeping and mopping the floors before having visitors over. Think as a person who is buying a house. You want at least the floors to be nice. You want tiles flooring because it’s attractive. The common places people are inspecting when looking a houses is the kitchen, bathrooms, entryways and other high-traffic areas. These places is where the tile restoration is very important. In the kitchen, is where family members get together and pass through when getting ready to leave the house. A lot of dirt and debris gets accumulated. Not to mention the food, spilled cooking grease, dropped food, and mishandle drinks can damage the tile. The bathroom are more exposed to statins. One will clean and tidy up the place regularly. But the floor around the sink, toilet and tub/shower can easily become dirty and stained. Mold, mildew, vomit, and urine can leave permanent stains in your grout. Heavy abrasive cleaners cannot wipe the traces away from bathroom disasters. Before putting your house on the market, consider restoring the tile that is in your kitchen and bathroom at the very least. Baking soda and water should do the job in Phoenix tile cleaning away the dirt and stains. Click here to learn how to properly clean your tiles. Another form of cleaning the tiles and grout is with vinegar and baking soda. These two ingredients will restore the tile and grout color back to new. Again, selling your house is a hassle. 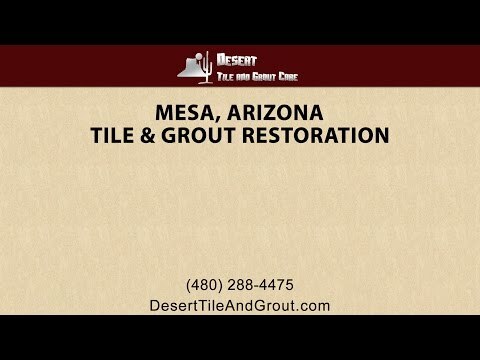 Desert Tile and Grout Care is Arizona’s company that specializes in providing the top-industry tile and Mesa grout cleaning services. If you have your hands full selling and buying a house, we can lead a hand. Our Mesa tile cleaning experts are trained to work on floors of all types, including ceramic tile and grout, brick patios and walkways, marble floors, Mexican tile, Travertine tile and more. What are you waiting for? Contact us, and we’ll be able to consult and guide you through restoring your tile and grout.